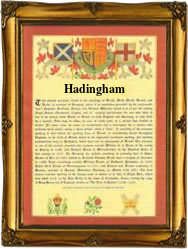 Recorded as Hadingham, Headingham, and Hedingham, this is an English locational surname. It almost certainly originates from the twin villages of Castle and Sible Hedingham in the county of Essex. Locational surnames are usually "from" names. That is to say surnames given to people after they left their original homes and moved elsewhere, usually in search of work. This certainly applies here, as with the exception of two early recordings in 1732 shown below and 1780, the surname is rarely ever recorded in its home county of Essex. The villages are first recorded as Hainghehan in the famous Domesday Book of 1086 and as Heyngham in the year 1231. It is believed that Castle Hedingham means "the fort of the Hypinga tribe with the landing place on the river", whilst the Sible in Sible Hedingham refers to a lady called Sibillia, who held the manor of Hedingham in the year 1230. The surname examples include: Richard Hedingham, who married Sarah Dow at Halstead in Essex, on July 1st 1732, and in the diocese of Greater London, David Hadingham who married Mary Nix at the church of St Mary le Strand, on August 28th 1797.